Here’s the Terms and Conditions of our June sale. How long does the sale last for? Our sale is on from now and ends the 30th June 2018, or until stocks sold out. Which Trailers are included in the sale? We reduced the price of our Johanna, Buckley, Hopetoun and Allendale Camper Trailers. The sale price is listed on our site. 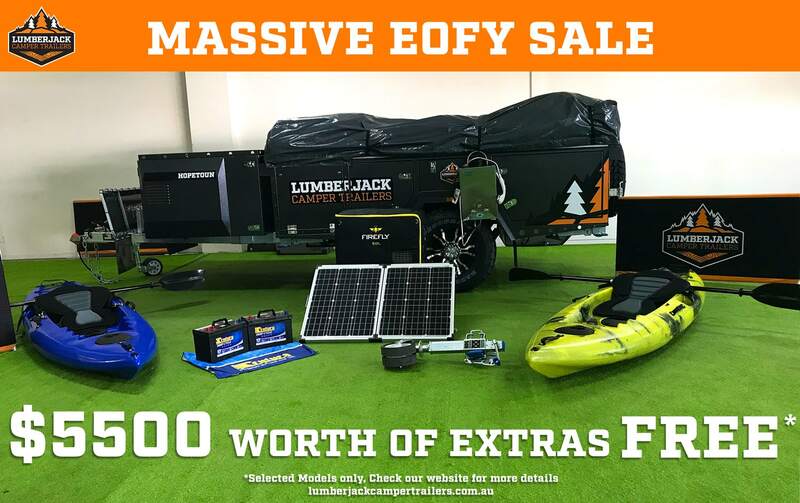 Gas plumbing, 50L fridge, Century battery upgrade, Hot water system, Ark jockey wheel upgrade, 120w Solar panel, 2 x Single kayaks, Registration. When do I have to pay for my trailer? Upon order, you will need to make a deposit payment of $1,000 and the balance of the trailer to be paid in full by 30th June 2018. When can I pickup the trailer? The trailers are in stock and ready to go. You can visit our Geelong showroom or call us to place the order over the phone. Where do I pick up the trailer? To secure this amazing deal, we are offering free Geelong store pick up. If you are unable to pickup from Geelong, we can transport the trailer to our Brisbane, Adelaide or Oxley showrooms, however dealer delivery will apply. Please give a call and we can provide you with a quote for delivery charges.